Your wine collection can easily look as classy as it tastes with this superior countertop wine cooler by Danby. This model can store and chill up to 12 bottles of your favorite wines at a time and can quickly and effortlessly be programmed anywhere between 50°F and 64.4°F via the intuitive push-button thermostat. The tastefully-designed wine cellar comes with a sleek midnight-black finish with a fashionable clear-glass door while the mood-setting blue LED interior light can be turned on or off as desired. This smart appliance is quite eco-friendly since refrigerants aren’t used as it boasts clever, energy-efficient semi-conductor cooling technology. The wine bottles are gently cradled by the three sturdy chrome-storage shelves and the silent operation guarantees they’re not disturbed by unwanted vibrations. 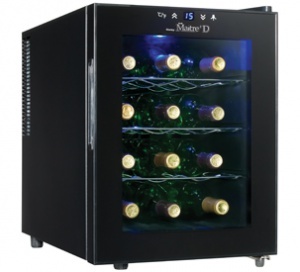 This timeless wine cooler comes with a three-month warranty on parts and labor and nine months coverage on parts only.